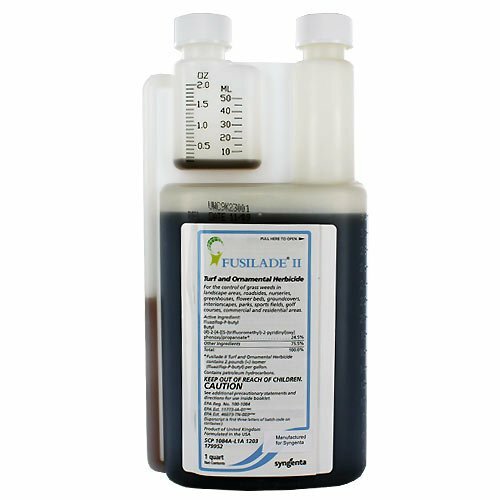 PRODUCT DESCRIPTION: Fusilade II Turf and Ornamental Herbicide is a weed killer which contains 24.5% Fluazifop which provides outstanding post-emergence control of unwanted grasses in groundcovers, shrubs and trees. 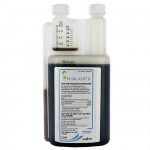 Fusilade II moves quickly into the shoots, roots, rhizomes, stolons and growing points of the treated plants. Weed growth is soon arrested and within a week you'll witness loss of vigor, yellow and/or reddening of treated grass weeds. Fusilade II can save you the cost of expensive hand weeding. Fusilade II takes out unwanted grass without injury to desirable broadleaf plants, conifers, newly emerging ornamentals and recent transplants. Some species or varieties of ornamentals require that Fusilade II be applied as a direct spray in order to minimize phytotoxicity. Target Weeds: Barnyardgrass, Broadleaf signalgrass, large and smooth Crabgrass, Fall Panicum, Field Sandbur, giant, green & yellow Foxtails, Goosegrass, Guineagrass, Itchgrass, Johnsongrass, Junglerice, Praire cupgrass, Red rice, Southern sandbur Southwestern cupgrass, Texas panicum, Volunteer barley, oats, rye, milo, corn, & wheat, Wild oats. Wild proso millet, Witchgrass, Woolly cupgrass, Bermudagrass, Quackgrass, Torpedograss, and Wirestem muhly. RATE OF APPLICATION: The mixture rate is variable but .5 oz per 1000 sq/ft covers most grassy weeds. This means a quart can cover up to 1.5 acres.